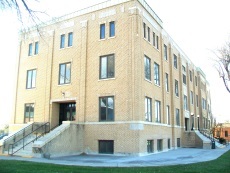 Nominated for its association with the Works Progress Administration (WPA) New Deal program the Grant County Shop (Grant County Museum) was one of six WPA projects in Grant County. 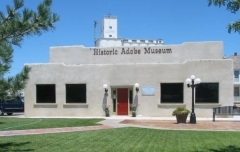 Originally constructed in 1937-1938 as a machine shop for the county, it is a one-story adobe block building with a parapet roofline. Utilized as a machine shop into the mid-1970s, the Grant County Historical Society obtained it in 1978 to be used as a museum. Located on the Cimarron River, the Lower Cimarron Spring was a stopping place along the Desert Route of the Santa Fe Trail. Used primarily prior to the Mexican War, the spring was the first offering of water during the dry season on the 60-mile stretch of the Cimarron Cut-off Route of the Trail. 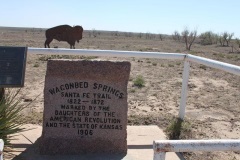 The Spring was located on the worst and most dangerous stretch of the journey to Santa Fe. The site was nominated for its association with the mid-nineteenth century expansion of settlement. From 1821 until 1880 the Santa Fe Trail figured prominently in the history of the American West. The route of this trail between the Missouri River and the Rio Grande was a highway for travel and communication between these two areas of North America. It was the first great Euro-American land trade route, and it differed from the Oregon, California, Mormon, and other trails which served as highways for emigrants bound for new homes in the far West. The bulk of traffic along the Santa Fe Trail, especially prior to 1848, consisted of civilian traders - Hispanic and American - with some military traffic and few emigrants. The amended NHL nomination was approved by the National Park Service on August 6, 1998. The amended National Register nomination was approved on September 25, 2013. The Santa Fe Trail - Grant County Segment 1, also known as Klein's Ruts, is located in Grant County, in southwest Kansas. 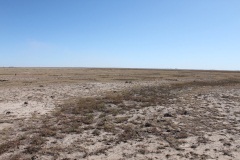 This segment is part of an approximately 40-mile branch of the Cimarron Route that was located entirely within the waterless area known as La Jornada and connected the Mountain Route at the Upper Crossing of the Arkansas River near Lakin, Kansas with the Cimarron Route. Relatively little is known about this branch between the two rivers, but the first known use of the Upper Crossing in relation to the trail was during a survey expedition led by George Sibley in 1825 (though he did not survey this site). The nominated property includes several visible trail swales where at least 20 shallow ruts converge to form four main arterial ruts. It was nominated for its significance in the areas of transportation and commerce, and it has the potential to yield additional important information about this 40-mile branch road between the Arkansas and Cimarron Rivers in Kansas.